Posh striker Paul Taylor tries to fend off Barnsley misfielder Conor Hourihane. Photo: Joe Dent/theposh.com. 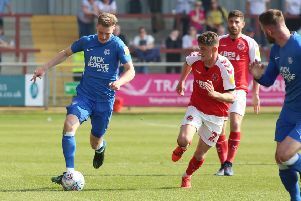 Those who believe Peterborough United have an ‘average’ side won’t be dissuaded by a pre-season record of three wins and three losses from seven matches. But, as two of those victories came against Championship opponents, manager Grant McCann is probably right to feel pleased with his team’s summer performances. Posh right-back Hayden White tries to get the ball off Barnsley striker Sam Winnall. Photo: Joe Dent/theposh.com. True, they started their final friendly at home to Barnsley today (July 30) poorly and fell behind to a sixth-minute header from a corner from Josh Scowen, but they showed enough enterprise and spirit from then on to feel disappointed that Stefan Payne claimed a second headed goal for the Tykes in the 89th minute. Barnsley winger Adam Hamill curled an early free-kick just past a post before Scowen glanced home an inswinging corner and Posh ‘keeper Mark Tyler - a late call-up for number one Ben Alnwick - had to react smartly to stop Alfie Mawson’s set-piece strike a few minutes later. But Posh grew into the contest thanks to the excellent promptings of midfielders Chris Forrester and Gwion Edwards and they should really have had a penalty when Jermaine Anderson was dragged to the ground as he looked set to get on the end of Paul Taylor’s cross. Edwards then glided past two defenders before forcing a fine tip-over save from Nick Townsend from 25 yards and the Barnsley ‘keeper went on to have a fine game producing excellent second-half stops from Marcus Maddison, Shaquile Coulthirst and substitute Tom Nichols. Posh skipper Chris Forrester battles for possession with Barnsley's Josh Scowen. Photo: Joe Dent/theposh.com. Paul Taylor struck an upright on 42 minutes, but Barnsley also had their moments going forward with Tyler saving well from a Conor Hourihane volley midway through the first-half and superbly to deny Payne a few minutes before the former Dover striker did score. Edwards was preferred to young Leo Da Silva Lopes from the start of this game, but the 17 year-old made a couple of dazzling contributions in the final 20 minutes which suggests he could yet force his way into the starting line-up for the League One opener at Rochdale next Saturday (August 6). Right-back Michael Smith missed the game with a thigh problem giving Hayden White his chance to stake a claim for a start at Spotland. Posh: Tyler, White, Hughes, Tafazolli, Baldwin, Forrester, J. Anderson (sub Da Silva Lopes 69 mins), Edwards, Maddison, Coulthirst (sub Nichols 69 mins), P. Taylor. Unused subs: Bostwick, Nabi, Chettle. Barnsley: Townsend, Whyte, Roberts, Scowen, Hammill, Hourihane, Winnall (sub D’Ameidia 73 mins), Yiadom, Bradshaw (sub Watkins 61 mins), Mawson, Kent (sub Payne 77 mins). Unused subs: Moncur, Lee, Nyatanga, Evans, Tuton, Walton. Goals; Barnsley - Scowen (2 mins), Payne (89 mins). A young Posh side lost 5-3 sat Ken Charlery’s Ware FC today. First-team squad members Jon Taylor and Ricardo Santos both scored to give Posh a 2-0 half-time lead before the home side fought back in stle after the break. Posh did make numerous chances after the interval. One young sub Deon Moore scored a late goal.